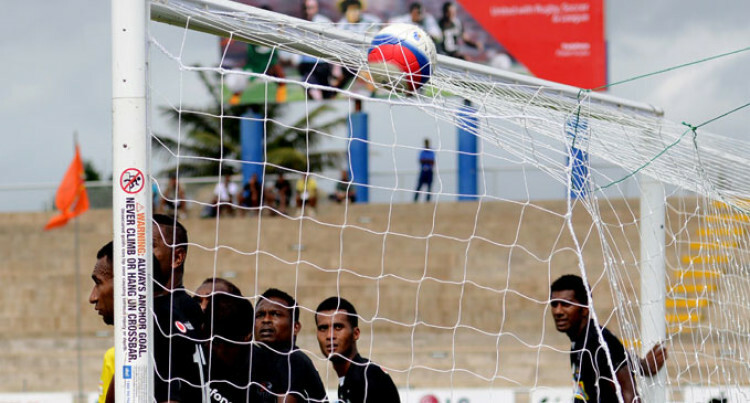 Courts Inter-District Championship defending champions Ba lost 1-0 to Nadroga in their first game yesterday at the ANZ Stadium, Suva. Ba coach Ravinesh Kumar would not rule out their chances just yet after they drew 1-1 with Lautoka last week. “This is not the end, we still have one more game to play and the players played well but were unlucky.” Kumar said. Ba plays their last game today against the B.O.G winners Rewa at 5pm. In the 52nd minute, Ba was reduced to 10 men as Ronald Lawrence was shown the red card from dangerous play on Nadroga’s Gerard Voi. In the 62nd minute, Nadroga made use of the opportunity with Krishneel Dutt scoring from a free kick. This was a wakeup call for the Men in Black as they struggled to find the equaliser but fell short. Star turn: Nadroga’s Krishneel Dutt was the star of the show as he caused the first upset of the annual event. Big play: Both goalkeepers were on par and prevented either side from scoring a goal in the first half and most of second half.